Today the States Parties to the Convention on Conventional Weapons (CCW) agreed to convene a meeting to discuss fully autonomous weapons or killer robots in May 2014. Mines Action Canada (MAC), a co-founder of the Campaign to Stop Killer Robots, welcomes this historic decision to begin to address this issue. MAC encourages all states to pursue an international ban on these weapons to ensure there will always be meaningful human control over targeting decisions and the use of violent force. We are pleased that Canada made its first public statements on this topic during the CCW joining the other 43 nations who have spoken out on fully autonomous weapons since May. MAC looks forward to working with the Government of Canada to develop national policies on fully autonomous weapons. Along with our colleagues from the Campaign to Stop Killer Robots we hope to see Canada actively participate in the CCW discussions. Mines Action Canada encourages Canada to take on a leadership role in international efforts to ban fully autonomous weapons and ensure that humans will always have meaningful control over life and death decisions in conflict. “If we have learned anything from the Canadian led efforts to ban landmines, it is that the world cannot afford to wait until there is a humanitarian crisis to act. We need a preemptive ban on fully autonomous weapons before they can cause a humanitarian disaster,” said Paul Hannon, Executive Director, Mines Action Canada. 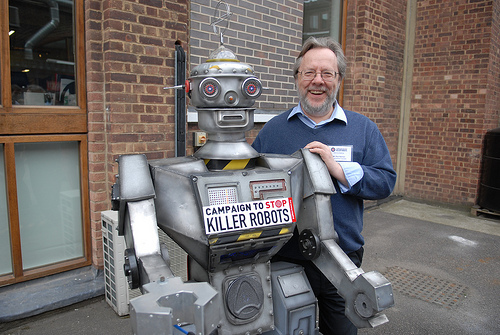 For more details on the CCW mandate, please see the international web site for the Campaign to Stop Killer Robots. Posted on November 15, 2013, in Campaign, Events and tagged Autonomy, Canada, CCW, Convention on Certain Conventional Weapons, Geneva, Human Rights Watch, killer robots, Mines Action Canada, Robot, Stop Killer Robots, United Nations. Bookmark the permalink. Leave a comment.